Copyright © 2014 J&T Technologies, Inc.. All rights reserved. Q: How Does Ion Exchange Work? Ion exchange resins are polymers that are capable of exchanging particular ions within the polymer with ions in a solution that is passed through them. The synthetic resins are used primarily for purifying water, but also for various other applications including separating out some elements. 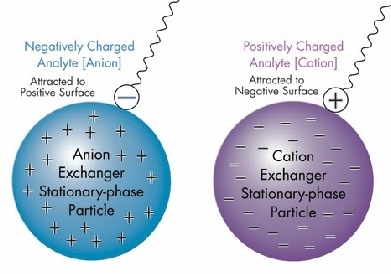 A standard dual bed ion exchange unit consists of a strong acid cation resin that exchanges hydrogen for positively charged cations present. The second step is a week or strong basic anion resin that exchanges hydroxide for negatively charged anions present in the water stream. The hydrogen (H+) from the cation exchanger and hydroxide (OH-) from the anion exchanger create the HOH or deionized water to be reused in the process. There are certain processes that generate an abundance of either a cation or an anion. If this occurs, a more selective weak acid cation can be used to exchange the multi-divalent heavy metals that are in abundance. This "pre-treating" of the heavy metals will assist in the exchanging of the mono-valent cations. A weak basic anion before the strong basic anion can be implemented to assist in pre-treating for hexavalent chrome. The cation ion exchange resin are regenerated with an acid to exchange the hydrogen back onto the cation resin beads. The anion is regenerated with sodium hydroxide to exchange the hydroxide back onto the anion resin beads.